Rivers in urban locations frequently receive contaminated wastewater and particulate waste either directly from storm overflows or from sewage treatment facilities. Although many urban streams are now recovering from wide-scale historic pollution, lower-level effects on water chemistry, nutrients and biotic composition are still widespread. We aimed to determine whether such effects could be detected using stable isotope ratios (δ15N, δ13C and δ34S) in macroinvertebrates alone or in conjunction with traditional biomonitoring. Macroinvertebrates were collected upstream and downstream of 11 different secondary wastewater treatment works (WwTW) in South Wales and the Welsh borders (United Kingdom). Overall, mean invertebrate δ15N signatures downstream of the WwTW were significantly enriched despite variation amongst sites. Moreover, changes between upstream and downstream macroinvertebrate δ15N values were highly correlated with patterns in macroinvertebrate community composition, increased total macroinvertebrate abundance, and reduced Shannon Diversity and other biomonitoring indices (% EPT, % shredders and ASPT scores). Changes in invertebrate δ15N values also paralleled the consented discharge volumes and population equivalents from each WwTW. In contrast, isotopic ratios of δ13C and δ34S were unable to distinguish or quantify wastewater input into the rivers but differences were apparent amongst study streams. Overall, these results suggest that macroinvertebrate δ15N signatures can detect and quantify the effects of secondary sewage treatment inputs to riverine ecosystems. Moreover, the method potentially provides a sensitive means for tracing sewage-derived nutrients into food webs while inferring effects on aquatic communities where sewage-loads are subtle or confounded by other stressors. The authors acknowledge funding for this study provided by the Royal Society and Leverhulme Trust in addition to in kind funding from the NERC Life Science Mass Spectrometry Facility for analytical stable isotope support. Abbie Jebson assisted with the field and lab research, and Isabelle Durance completed the GIS mapping and data extraction of population densities and urban land cover. The authors thank also Welsh Water for their assistance in providing and interpreting the WwTW consent data and their assistance with study design. Two anonymous reviewers provided useful comments which improved the quality of the manuscript. Schmidt-Kloiber, A. 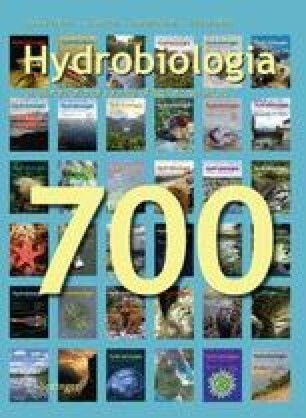 & D. Hering, 2012. www.Freshwaterecology.info – the taxa and autecology database for freshwater organisms, version 5.0. Vaughan, I. P. & S. J. Ormerod, 2012. Large-scale, long-term trends in British river macroinvertebrates. Global Change Biology. doi: 10.1111/j.1365-2486.2012.02662.x.